For two glorious months, one lucky family gets an intimate peek at the daily activities of a mother hummingbird and her babies. Nest building, egg hatching, flying lessons--the family sees it all unfold on the back patio. 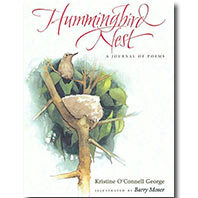 Share the experience through this poignant journal of poems filled with funny observations, fascinating hummingbird facts, and unforgettable moments. Scroll down or flit below. A wonderful quote we just couldn't squeeze into the book . . .
See the Teacher's Guide for activities, videos, and additional resources and information about hummingbirds. My first video! I like to think Anna or her babies. might be part of this crowd! as the nest of the hummingbird. The finding of one is an event. Imagine my family's delight when we realized that a mother hummingbird was building a nest in the small potted tree on our back patio! For roughly two months, we had our very own private nature show — live and in full color! Publication of Hummingbird Nest has been a wonderful way to remember this extraordinary experience — from nest building to two successful solos. Shortly after that, fledgling and mom disappeared from our yard; our hummingbird drama was officially over. I feel very fortunate to have the opportunity to share our experience with readers through my poetry and Barry Moser's exquisite watercolors. As John Burroughs says in his quote above, the finding a hummingbird nest is "an event." It truly is!